America was instantly enthralled with the 30-30 Win round when it first hit the scene in 1895. The 94 Lever action rifle from Winchester was one of the first rifles to chamber the 30-30 Win. The 94 Lever action and the 30-30 Win combined to make Winchesters first smokeless powder cartridge design and rifle combo. Ever since, the 30-30 has held its place as popular rimmed cartridge among medium to large game hunters, lever action rifle shooters, wild west re-enactment groups, cowboy action competition shooters, and other target shooters across the nation. 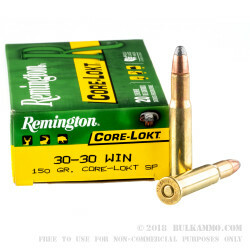 Remington’s Core-Lokt Ammo group now has the .30-30 Winchester caliber added to its line-up, making it a superior choice for feeding that lever action. 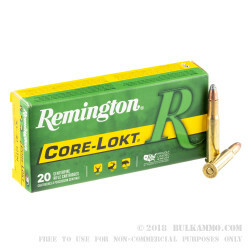 The Remington Core-Lokt 30-30's have a 150 grain, lead core, Soft Point bullet with a thick copper jacket that covers all the but the tip. 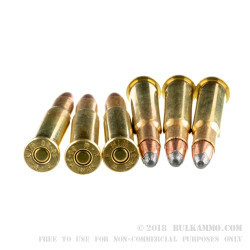 These SP bullets feature lead tips that provide the shooter with a reliable platform that causes maximum expansion upon entering the game animal, while retaining most if its mass. Each Soft Point Bullet is loaded into a new, heavy duty, thick walled, reloadable, Boxer primed non-corrosive, rimmed, yellow brass case. These cartridges have muzzle energy that hits with an impressive 1,902-foot pounds, and the muzzle velocity itself is equally impressive with a speedy 2,390-feet per second. 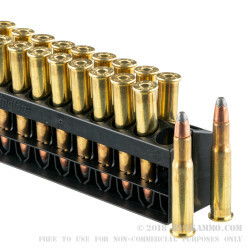 These .30-30's are ready to compete in their 20 round yellow-green boxes. They are simple to take with you anywhere you go, plinking fun with the family, on your hunting trips, or testing the limits of a new lever rifle. Grab some today!